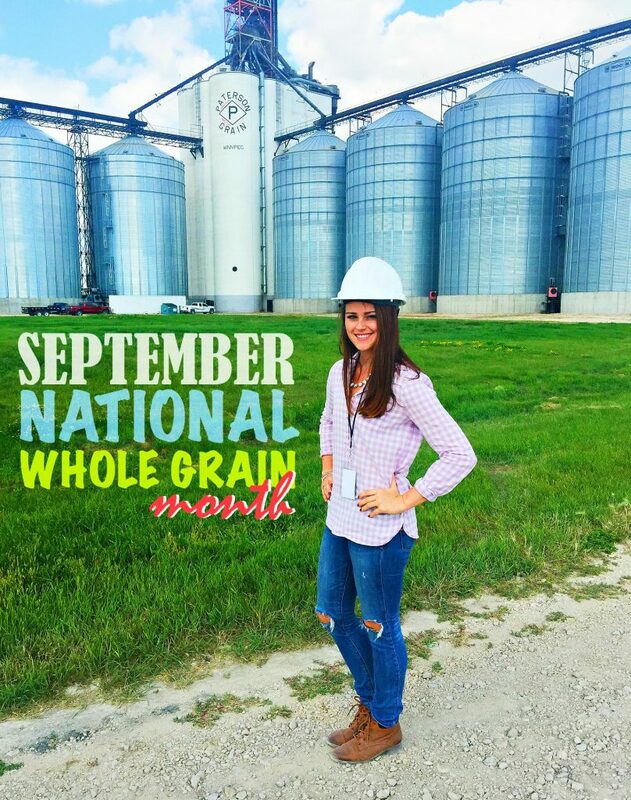 Happy National Whole Grain Month! 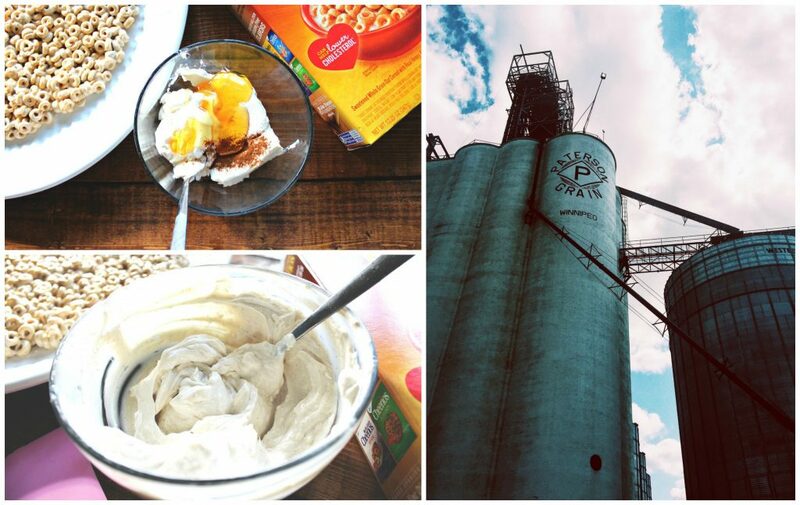 I had such a fun opportunity last month to join a group of bloggers and General Mills on a trip to Winnipeg, Canada. 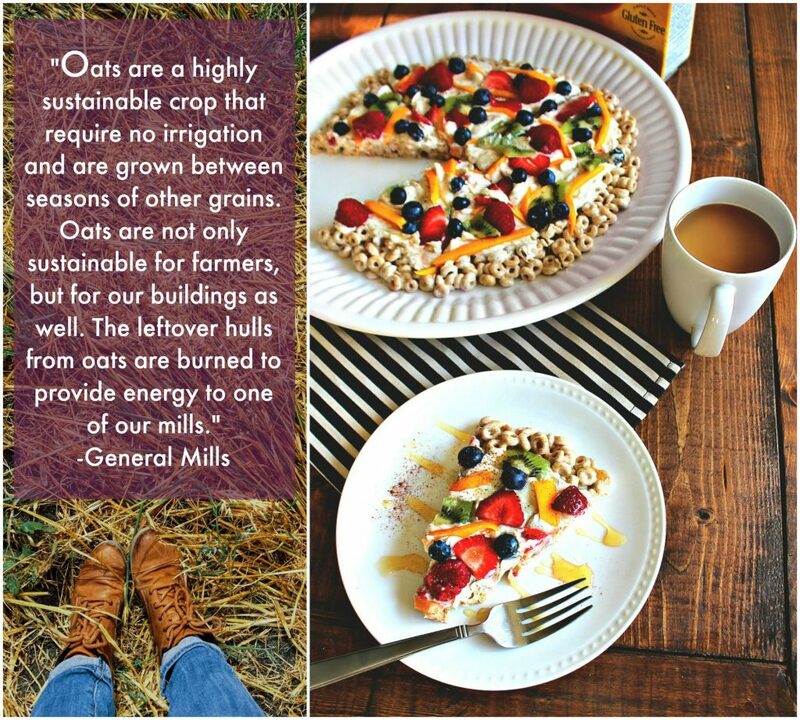 We learned a lot about the farms that grow our oats, the importance of whole grain in our diet, and how our oats make it to our cereal bowls. Did I say “oats” enough? 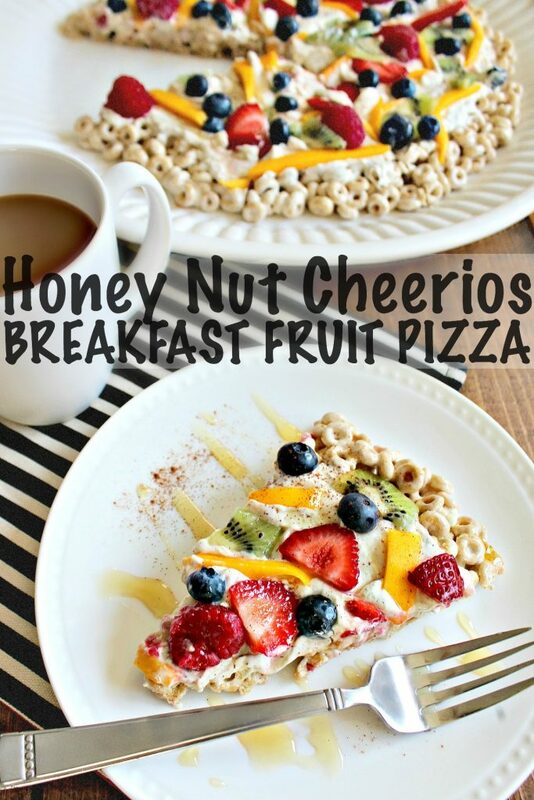 In honor of National whole grain month, I’m teaming up with General Mills to bring you guys a delicious Honey Nut Cheerios breakfast fruit pizza recipe! 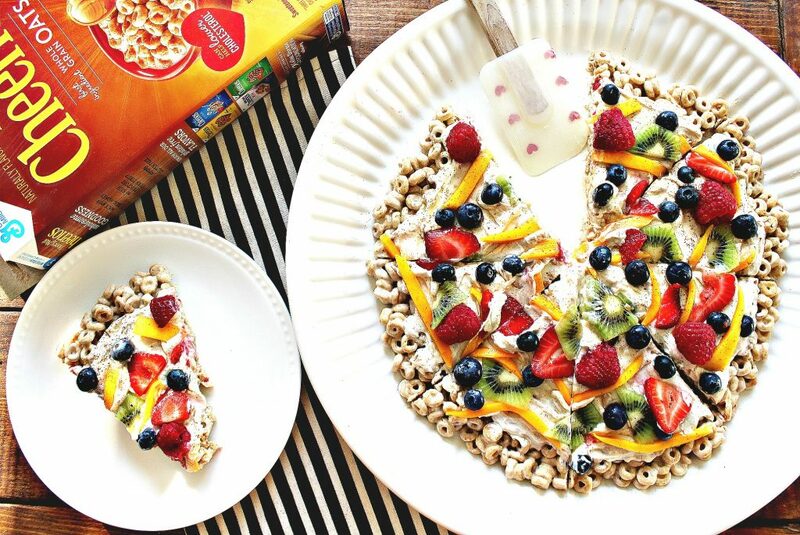 Cereal is a great source of whole grain and the perfect way to start your day (Or end your night!) Cereal with whole grain as the 1st ingredient has beneficial vitamins, fiber, magnesium, iron, and for me, it keeps me fueld for a productive morning. 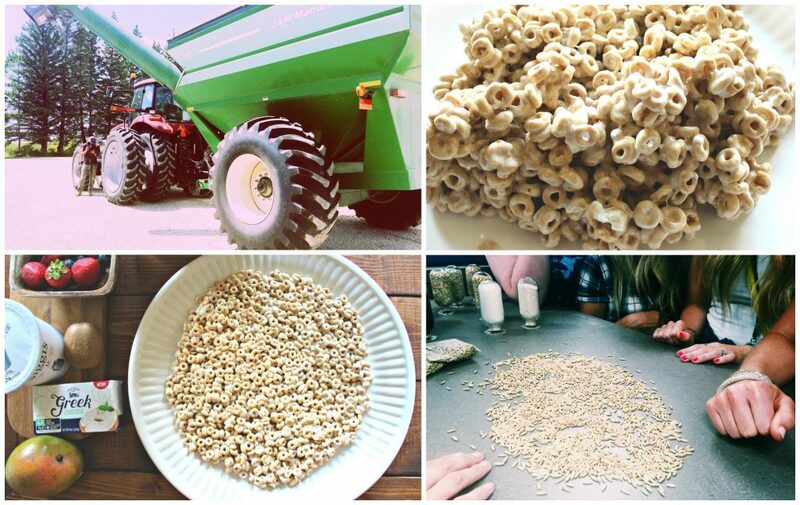 I hope you enjoy this recipe and all the fun facts about Whole Grain! 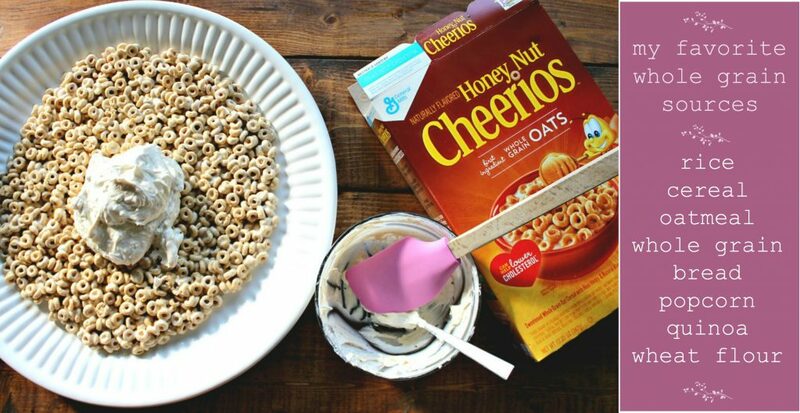 I chose Honey Nut Cheerios for my recipe because they are my absolute favorite and they are made with whole grain oats. I eat Honey Nut Cheerios at least five times a week. This recipe is super fun, easy to make, and absolutely no baking involved. You can customize the ingredients to fit your dietary needs, or tastebuds! 1. Melt butter over medium heat in a large saucepan. Once the butter has melted, add marshmallows, 1 tablespoon of honey and stir until all the marshmallows are melted and creamy. 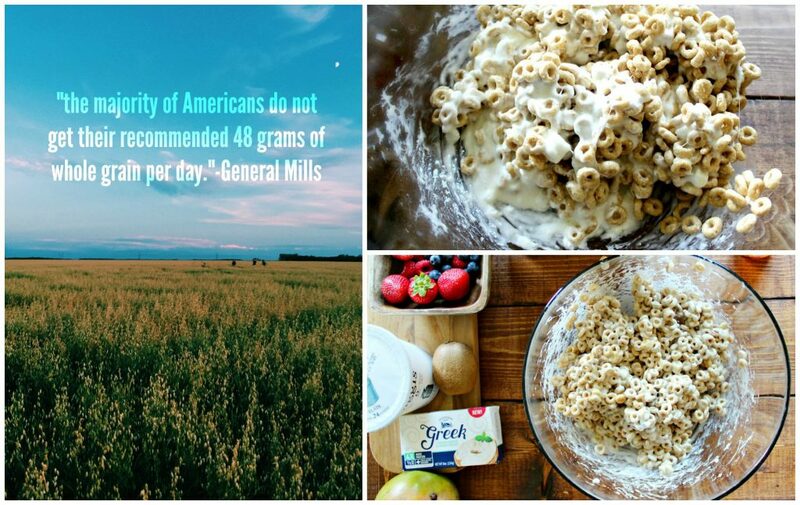 About 95% of Americans do not reach their recommended 48g of whole grain per day! 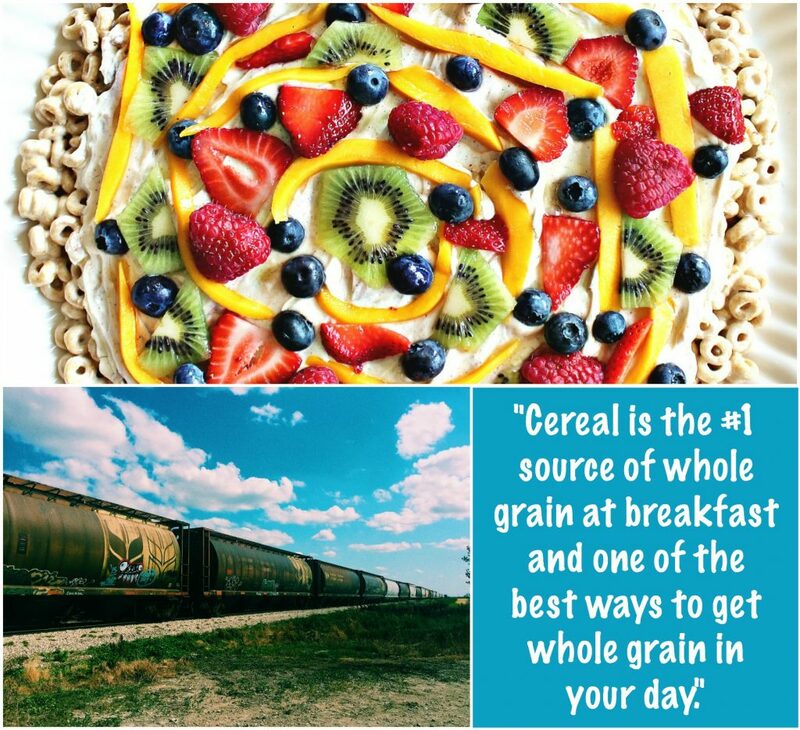 There are so many ways you can fit whole grain into your diet! 2. Pour melted marshmallows in a large glass bowl with the Honey Nut Cheerios. Mix together until Cheerios are coated. 4. In a small bowl, mix cream cheese, yogurt, two tablespoons of honey, and one teaspoon of ground cinnamon together. You can fit your whole grain into ANY meal. 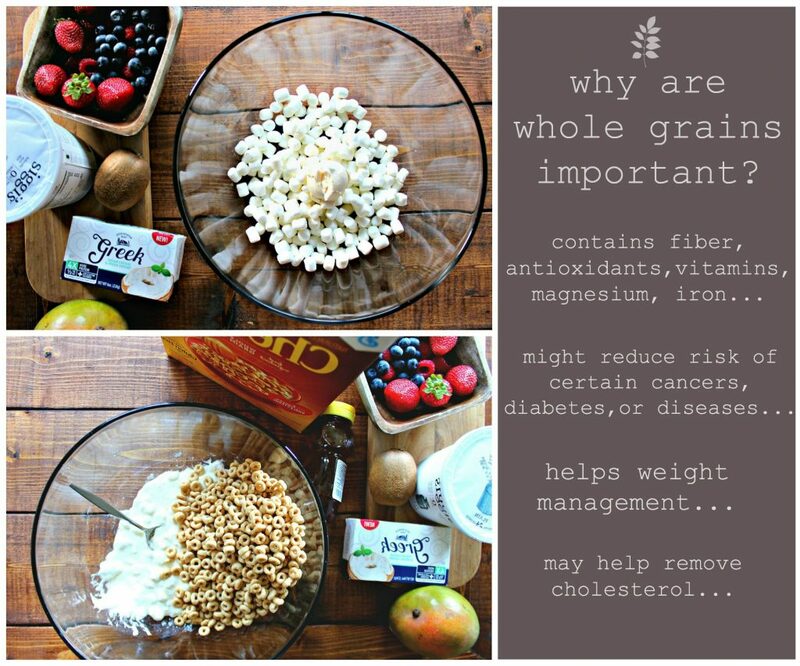 Start your day off with a bowl of cereal with whole grain as the first ingredient. Pile your veggies onto whole grain crackers with hummus for lunch. Serve your dinner with a side of whole grain rice. End your night with popcorn topped with dark chocolate chips. 5. 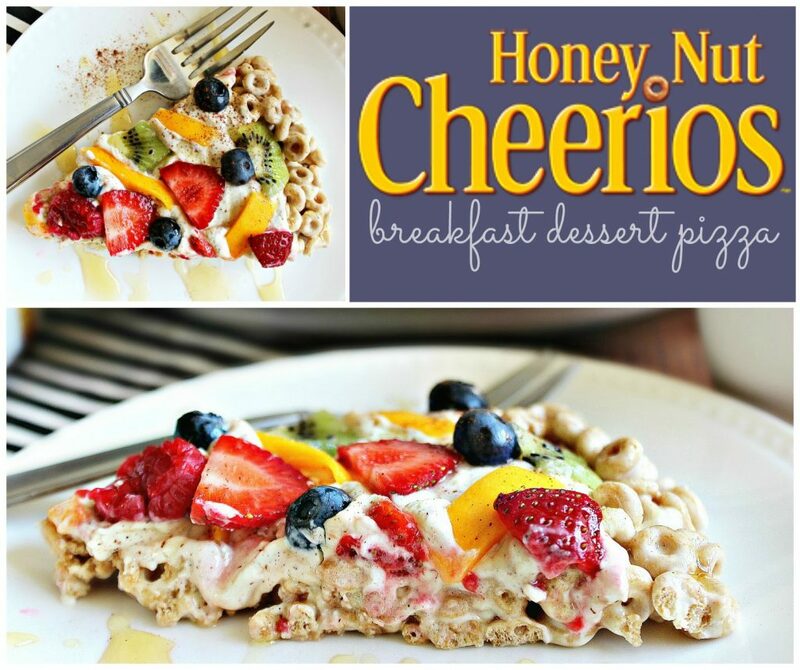 Spread the cream cheese mixture over the Honey Nut Cheerios crust. Leave a half-inch of the edges uncovered. 6. 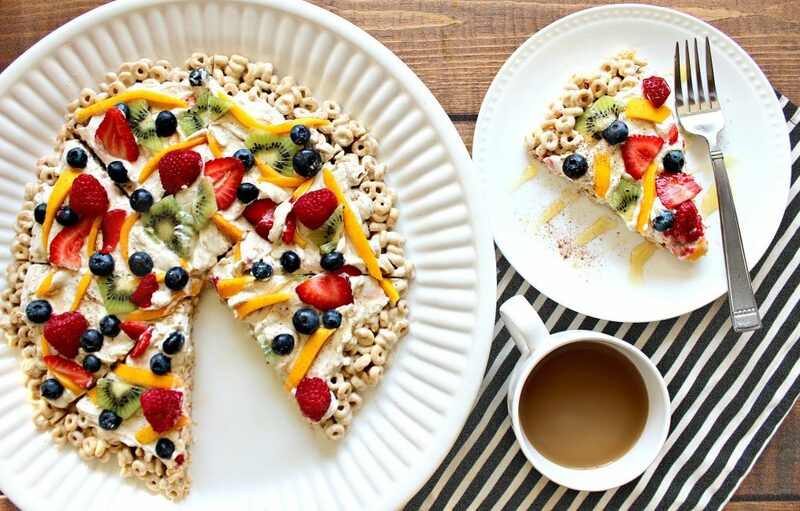 Top the breakfast pizza with your choice of fresh fruit, a honey drizzle and a sprinkle of ground cinnamon. 7. Keep refrigerated until served. This breakfast pizza is the perfect treat for special mornings, office parties, tailgates, weekend treats, or holidays. This was such a treat and I cannot wait to make it again! I want to try it with Cocoa Puffs and a chocolate cream cheese spread. 6. 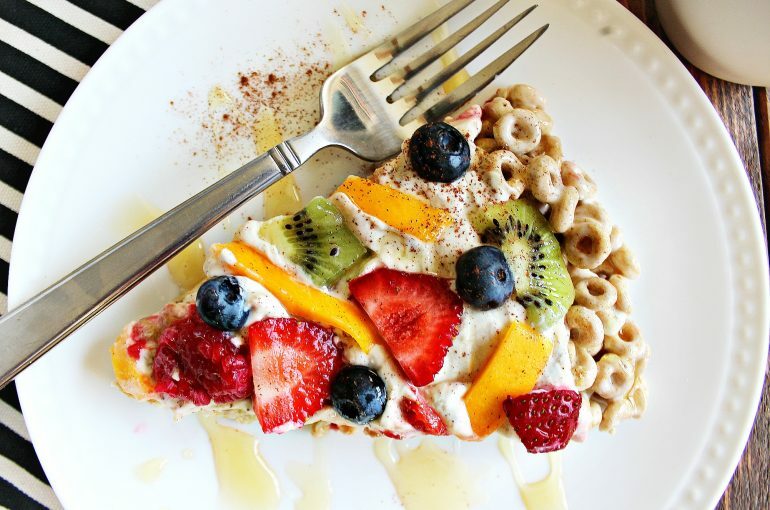 Top the dessert pizza with your choice of fresh fruit, a honey drizzle and a sprinkle of ground cinnamon. 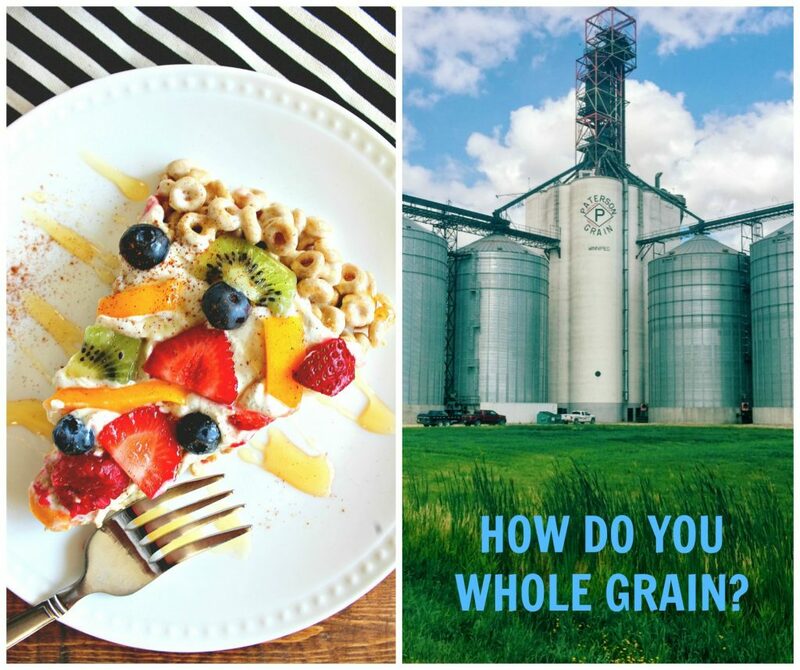 How do you get your daily whole grain? Which breakfast cereal should I use in my next recipe…Cocoa Puffs, Reese’s Puffs, or Pumpkin Spice Cheerios? Why do you love cereal? 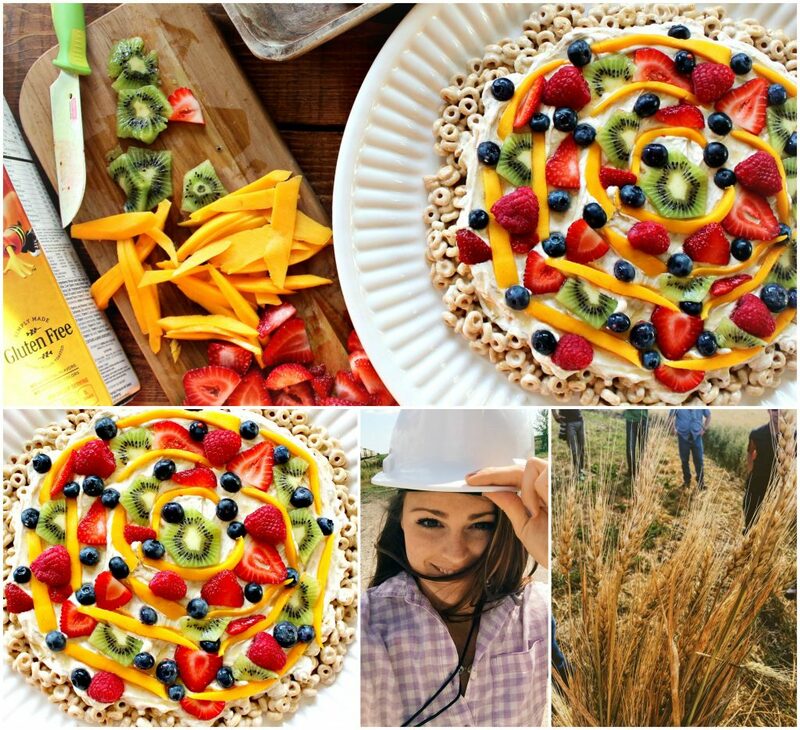 Love the creativity and I will not start eating whole grains! What is that greek cream cheese in your picture of the ingredients? I use cream cheese all the time in recipes but I’ve never heard of greek cream cheese and I can’t zoom in enough to see the details on the package. I found the Greek cream cheese at the grocery store. It tastes the same (almost better) and it’s a little lighter and has less fat naturally! Good to know. I’ll keep an eye out for it. Thanks! Mmm….this looks yummy! It’d be a nice, fairly-healthy dessert to serve! 1. OATBRAN AND OATMEAL. 🙂 Plus whole grain bread and noodles, as well as rice; I also bake with whole wheat flour instead of white flour. 2. 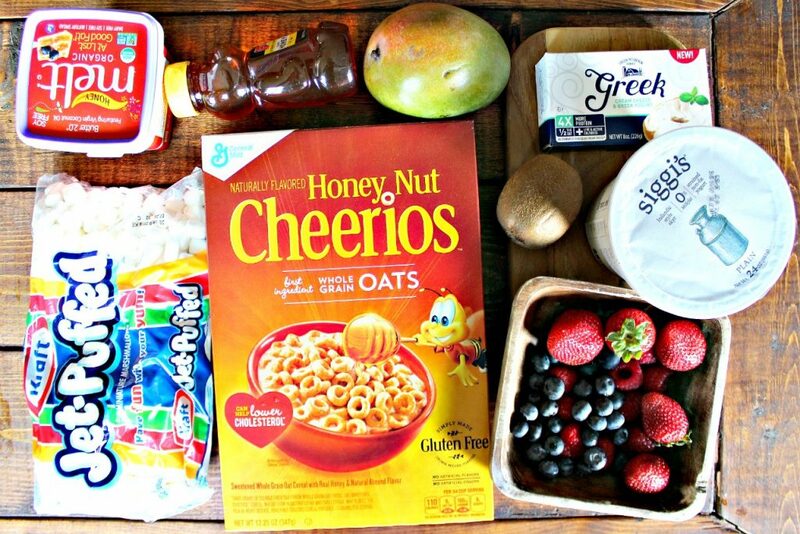 Oh my goodness–definitely Pumpkin Spice Cheerios! My mom brought me a box to try — I’d only seen them on your blog and hadn’t gone to the store to buy them — and I am kind of addicted! 3. It makes a great snack food — healthy (if you choose the right kinds) but sweet enough to curb a sweet tooth. I tend to eat cereal by the handful rather than by the bowl. I like to bake with whole wheat flour as well. I just made delicious pumpkin muffins with it & will post that recipe ASAP. They’re so good right!? I feel like this could be a treat to eat all year round! I agree. The right kinds of cereal can most certainly be healthy. Favorite way to get whole grains in? Cereal (because hello, it’s delicious! Cherrios are some of my favorites too! ), brown rice, oatmeal, and homemade bread. I would love if you made a pumpkin spiced version. Fall = all things pumpkin! 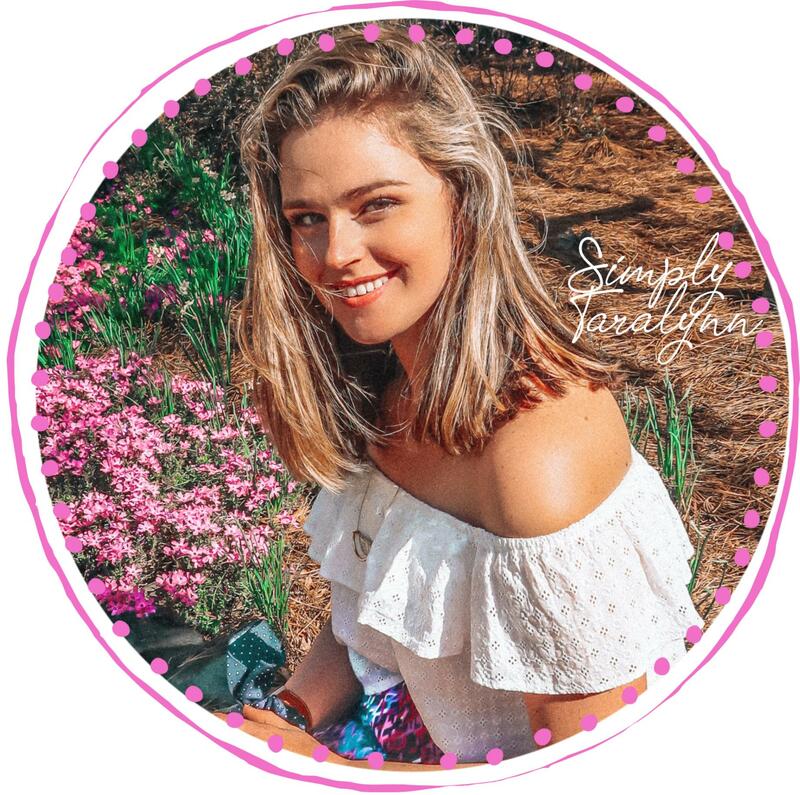 I LOVE following your photos on Instagram and congrats on everything! You & I both! Love homemade bread…mmmm especially with all the chunky grains. Awe! Thank you so much! Landon and I are so excited. It’s been a wild, beautiful ride. I love cereal! My faves are Honey Bunches of Oats with Cinnamon Clusters and Reese’s Puffs and Cinnamon Toast Crunch. I bought a box of Pumpkin Cheerios after you talked about them and I LOVE them!!! Cereal is such a comfort food for me so I usually eat it as a treat but I think I am going to try to eat it a little more often! I get most of my whole grains from bread and oatmeal! I’m so glad you loved the pumpkin cheerios!! -CEREAL!! 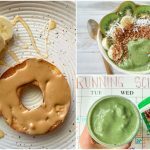 I am cereal obsessed, so this recipe is a winner for me! -It’s so easy when you don’t feel like cooking 🙂 And the crunch! Pumpkin Spice Cheerios are everything to me right now!! I think this would taste good with some chocolate chips! I think this is more like pie than it is pizza, but I guess pizza itself is already just a savoury version of pie! I had been eating Cheerios every morning until the past couple weeks since I’ve started a beachbody challenge! Now I’ve been getting them from rice most of the time 🙂 I’ll definitely be headed back towards cheerios once it’s done! Reese’s Puffs all the way. I have some at home right now haha it would be super good if you made it with some sort of peanut butter frosting/spread/whatever haha… more like a dessert pizza! I don’t know how you do it. I get Cheerio withdrawals! YES RP FOR THE WIN. That would definitely be a dessert pizza 🙂 & I’m all for it! Holy Crap! This is the coolest recipe. I get my whole grain from bread and oatmeal! My favorite cereal are lucky charms. I love getting my whole grains through oatmeal as well. When I was a kid, I’d steal all the marshmallows out of the lucky charms! I was the worst little sister. 1. I’m one of those low carb/scared of bread and pasta kind of girl. I prefer lettuce wraps over sandwiches and zoodles over spaghetti. Having a bowl of cereal or a slice of bread is a ‘treat’ for me and I leave those to Sunday cheat meals! 3. I don’t eat it all the time but there is something about a bowl of cereal with ice cold milk that just hits the spot sometimes. It’s almost ‘comfort’ food to me. It reminds me of so many college mornings and quite frankly, cheap college dinners!!! Can’t go wrong with a bowl of cereal and some skim milk! Carbs are good 🙂 Gotta fit in those whole grains and fuel yourself for workouts! I also love lettuce wraps though! I actually like them better than the toast or buns. Reeses Puff cereal is the best. Now that is my treat cereal. Sometimes I add a handful to my pop corn. I love how you know what your “LAST MEAL” is going to be if you had that chance. I know mine would be oreos with milk..and maybe some peanut butter and jelly sandwiches! I love cereal as a treat or late night snack. If I’m super hungry at night, I’ll have some cheerios with almond milk. I really hate Cheerios but this pizza is so cute!!! My favorite cereal is Special K. I wonder if I could use that instead! You will LOVE the pumpkin spice! 🙂 I want to make a pie crust with those cheerios! I need to get a bunch so I can have them all year round! & you’re welcome! thanks for stopping by to comment! -I try and get my whole grains in via brown rice or a nice hearty bread. – Please do one with pumpkin spice cheerios! I went out and bought some after you said how good they are and OMG a recipe using them would be great! 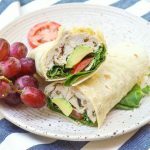 Those are great ways to fit in whole grain and i love hearty bread! I think it would be cool to crush them up for a pumpkin pie crust! I cuodlnt agree more with you! I love feeling like a kid again 🙂 Trix do that to me! Yum! I’d vote cocoa puffs because theyre my favorite or pumpkin spice because i love everything seasonal! Both my fave + Reese’s! This looks amazing! Such an original recipe! This recipe looks so good. I cannot wait to make it for my office ladies. GetSafe: DIY Home Security Monitoring!